Mary Pan is a Master’s student at the Yale Institute of Sacred Music, where she studies organ with Thomas Murray. A native of Burlington, Connecticut, she is a graduate of The Hartt School, University of Hartford, where she studied with Patricia Snyder and Renée Anne Louprette. Ms. Pan is a prizewinner in the Albert Schweitzer Organ Competition, the L. Cameron Johnson High School Organ Competition, and the AGO Regional Competition for Young Organists. She is a recipient of the M. Louise Miller Scholarship, the Dorothy Goodwin Summer Research Scholarship, the E. Power Biggs Fellowship, the Yankee-Pogorzelski Memorial Scholarship, and the Peter B. Knock Memorial Music Fund. 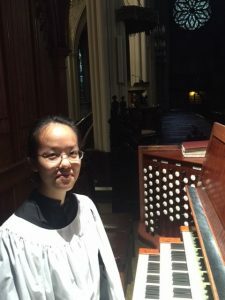 Ms. Pan was formerly organist and pianist at First Baptist Church in West Hartford, Connecticut and Chinese Baptist Church of Greater Hartford. Prior to her appointment as organ scholar at Grace, she served as organ scholar at Trinity Episcopal Church in Hartford, Connecticut. George Fergus, a native of Fort Worth, TX, is a candidate for the Master of Music degree at the Institute of Sacred Music at Yale University, where he is a student of Martin Jean. He holds a B.M. in organ performance with departmental distinction from St. Olaf College in Northfield, Minnesota, where he studied organ with John Ferguson and Catherine Rodland, and conducting with Steven Amundson. George has given organ recent recitals in Northfield and St. Paul. As a conductor, credits include Britten’s “Albert Herring”, Bernstein’s “Candide”, and Mozart’s Requiem, among others. 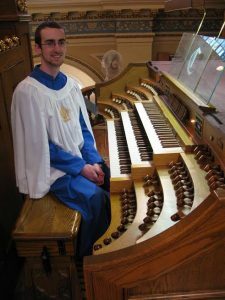 Before his appointment as the Organ Scholar at Grace, George served as the Organ Scholar at the Church of St. Louis King of France, in downtown St. Paul, Minnesota.